I used to struggle quite a lot with falling asleep, and I still have the odd occasion where I literally cannot fall asleep. I thought I’d share a few things I like to do before bed to help myself drift off a bit easier, and if not, it at least makes me feel more relaxed! I recently picked up the Lush Sleepy Body Lotion, and I can safely say its the best body lotion I’ve ever tried. This stuff smells heavenly, and is so perfect to apply once you’ve hopped out of the shower or bath. Its lavender scented, so as you can imagine, its perfect for helping you to fall asleep. I’ve heard a few people say that this has helped with their insomnia, but I don’t think its proven, so don’t hold me to that one haha. Staying on the lines of lotions, having a good skincare routine really helps me with feeling relaxed. 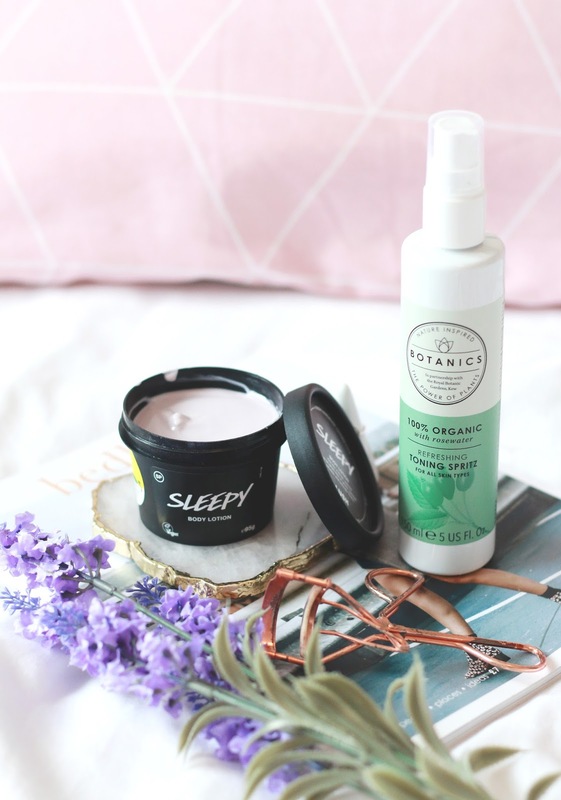 I’ve been loving the Botanics 100% Organic Rosewater Toning Spritz*. I think its the rosewater infused in it that makes it so relaxing to spritz over the face. Obviously, doing a face mask always works wonders too! Alongside the skincare, switching off before bed can be really helpful. Whether thats reading a book, I’m currently reading Wilde Like Me by Louise Pentland, or maybe reading a magazine. I’ve really been enjoying Bedboat, which is a lifestyle/beauty/photography magazine which is definitely my cup of tea. Do you have anything that helps you prepare for a good nights sleep?